One of my favorite things to do is to just start working with some beautiful fabrics…..batiks are my favorite and then just see what I end up making. After being a ambassador for Island Batik for the last couple of years I have hoarded collected a beautiful supply of batiks that I can use for projects like this. My first quilt made with Island Batik fabrics was my River Squares quilt and the following Spring in 2014 is when I became a ambassador. 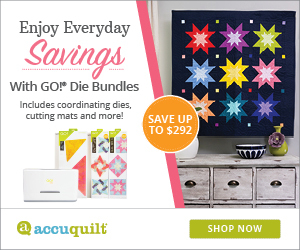 Every month I do a guest post on AccuQuilt’s blog and this month I used the AccuQuilt GO! 12″ Qube and a couple other applique dies. (Sorry, right now the link isn’t working). I started out making the background with the intention of adding some birds and flowers and all of a sudden this neat branch of flower blossoms just appeared! The minute I put the teal flowers on the orange and yellow background I just felt like it looked like something out of a Chinese garden. Once I finished it and was getting ready to write the post for AccuQuilt I googled Chinese Turquoise flowers and one of the first things I saw was the Chinese Forget Me Not flowers! Perfect name for my wall hanging! Sew two of the rectangles together along the 6 ½” side. Your blocks are now 6 ½” x 6 ½”. Join another rectangle to one side. Your blocks are now 6 ½” x 9 ½”. Use the following diagram to layout your blocks. Cut your dark brown fabric into four 4″ x 11″ pieces. Add the fusible web, I used Thermoweb Heat’n Bond Lite Iron-on Adhesive. Use the #55331 GO! Stems &Leaves die to cut out the stems. I cut two of the pieces with the fabric right side up and two with the fabric right side down. I cut out one group of the green leaves but decided not to use them. Cut your teal/turquoise scraps into eleven 5″ squares and add the fusible web to them. Use the #55334 GO! Fun Flower die to cut out the flowers. Add the fusible web to your dark brown fabric and then cut 3/8” strips on the bias for the branches. Cut your teal/turquoise scraps into eleven5″ squares and add the fusible web to them. Use the template to cut out the flowers. Remove the backing from your fused fabrics. Place your background piece on a surface you can iron on. Arrange the stems similar to the diagram below. Use a pressing cloth when you iron the stems to your background. Carefully iron and shape the branches. Arrange the blue flowers along the branches and iron them down using the pressing cloth again. Appliqué the branches and flowers in your favorite type of stitch. I use a straight stitch vintage Singer sewing machine to do mine. Layer your batting between the backing and the front. Quilt as desired. I did a free motion stipple quilting for the background using #2140 Gold 50 weight Aurifil thread. I thought you might also like a close up of my free motion applique that I enjoy doing on my vintage 15-91 Singer sewing machine. For ease in hanging the wall hanging I cut two 5″ squares, folded each one diagonally and added them to the top corners. Add your binding and you’re finished! Be sure and read my Mini Chinese Forget Me Not tutorial post also! Where is the pattern for the Chinese Forget-Me-Not Tutorial. Everything I click on takes me back to this page. I clicked on the blog link in a comment above, but I get Page Not Found. There is no pattern. Sorry about that, the link has been updated. Love your snowflake pink colors and all! The name of this quilt was truly inspired! Adding the beautiful flowers to the luscious background was an excellent idea. Your stitching make them even more beautiful. Hi Connie, I love your quilt . . . the pattern, the arrangement and the colors . . . perfection. I had to pin the photos, beautiful!!! Such amazing vibrant colours, and I love the relief effect of the flowers. Thank you for linking up with Free Motion Mavericks – your quilt is this week’s featured project! Love your choice of colors. I would like to buy the pattern or better yet do you offer a kit? Hi Connie, I wouldn’t have thought that bright oranges could make such a great background, but it really makes the turquoise sing! Well done! Happy Anniversary ! I totally love the color combo on the Orange/Aqua applique piece. Just gorgeous. Hope your concert was fun, I only live 20 miles from the Surf…Clear Lake is a fun town, Lots to do on the weekends. I am relieved that it is not only my eyes trying to read this. Clear Lake is really a beautiful town! Sorry about the light font in the comments…..it is the WordPress template I am using. The background is lovely. A great blend of colours and the simple piecing does not detract from the appliqué. A good colour choice for the flowers, they really pop. The machine embroidery on the flowers is very subtle in enhancing the design. Beautiful. Congratulations on your anniversary, have a lovely trip. What a beautiful piece! I love these colors together. Happy anniversary! Enjoy the concert! Chinese Forget-Me-Nots is stunning. The POP of turquoise on the oranges is brilliant. I love your Island Batiks and Accuquilt dies you use so smartly. I just love this one. That turquoise is so bold and yet just perfect against the orange. Seeing Clear Lake Iowa mentioned in your post made me think “small world”. My husband has been in that area for 8 weeks now working on a job site. I really do like this quilt! The colors really pop. Happy Anniversary! This is beautiful! Going over to check out the tutorial next. That is a GORGEOUS piece, Connie. I love the colors. Did you use the Crafted Applique technique with those flowers? Your quilting looks terrific on them. Have a wonderful trip. I’ll be picturing you a the Surf Ballroom! Enjoy the show. Free-motion applique on your 15-91 – WOW Connie! That is something I aspire to. The close up shot is amazing and your Chinese Forget-Me-Nots look beautiful against the sunny patchwork! Happy Anniversary and I hope you have a great time visiting family and seeing Kenny Rogers! Awesome! Just gorgeous!! Love the Chinese Forgetmenots! Happy Anniversary!!! Connie I clicked for your tutorial and couldn’t find it. I even tried doing a search and nothing. Oh and if I can make a comment about this comment box too: the font is so small and the gray color so pale that I am having a hard time reading what i am writing. It posts black, but this is sure hard on the eyes and probably full of typos too, since I can’t see what I am typing, lol!!! Can you fix the color to black and enlarge the font? Makes commenting a bit hard. Thank you for the information on the comment box! I will see what I can do to fix this, I changed a couple other things on my site that were too hard to read earlier but never thought about the comment box. If you or anyone sees anything else like this just let me know! What a cute project, you always think of great things! Enjoy your time away and Happy Anniversary! Wow Connie those forget-me-knots are gorgeous! I love that color combination of turquoise and orange. It’s striking!! Connie, those are such beautiful colors and I love the way you free motion the applique. I’m such a chicken that I don’t even like doing it with a zigzag stitch (which I do have!). You are an inspiration. Hope you are enjoying your trip and happy anniversary.